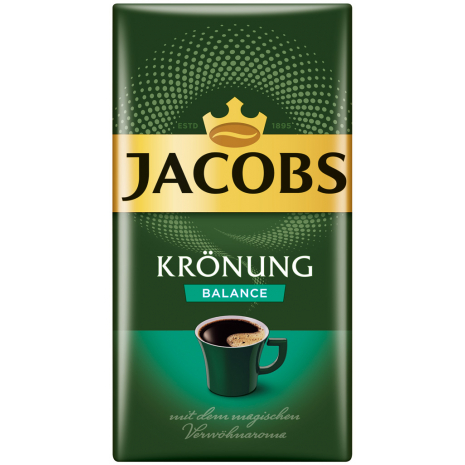 With the passion for coffee, Jacobs has compiled this special blend of caffeinated and decaffeinated premium coffee. The harmonious aroma only unfolds by the gently roasting, for which Jacobs stands with many years of experience. This ground coffee, Jacobs Kroenung Balance, is available in the 17.6 oz vacuum sealed package. With the passion for coffee, Jacobs has compiled this special blend of caffeinated and decaffeinated premium coffee. The harmonious aroma only unfolds by the gently roasting, for which Jacobs stands with many years of experience. Blend of 50% caffeinated and 50% decaffeinated roasted ground coffee. Mischung aus 50% koffeinhaltigem und 50% entkoffeiniertem, gemahlenen Röstkaffee.